Life has been so busy lately. Our house is starting to slow down. It will not stay here but the lull is rejuvenating. A great haircut yesterday and it looks almost as good as the stylist's today! Time to work on quilts. A talk with a good friend. Fresh sheets on the bed. Getting warm fuzzies while reading a the bible. Remember, the day is what you make it. All this after a nauseating migraine this morning. I really enjoy looking at Design Wall around the world. A few weeks ago mine looked very similar to one in Louisiana. Though I still have borders to put on the quilt, I have set it aside. The borders will be cut probably today. The pinning and sewing will occur at retreat in 10 days!! Judy at The Patchwork Times can show you all the links for today. After talking to the LQS, I get to teach a class. I have taught before, but never at a LQS for paying customers. With the support from all of you, I'm going to try. Here is my first attempt at a block that I wanted to teach. It is 3-D, not paper pieced and not so bad with all the little bias edges. After reading the directions again (oops-probably should have read them good the first time) I decided that I wanted to add the outside of the circle before sewing the whole thing together. Since I need more practice before I cut into the real fabric (LQS set it aside), I am trying again. Here is what I did yesterday. Recently my birthday came and went. The family was very busy the day of and a few gifts were opened the day before. Noteworthy were 2 magazines/books. Quiltmaker will be sending out all 100 blocks to readers that correctly identified designers of the blocks. I can only hope a great block comes my way! Also, on the way ho me from work on Tuesday, I enjoyed a quick jaunt to the local Hancock Fabric store. I like checking out the clearance aisle. This time I think that I did pretty good. Over the years, picking up a BOM at a pretty good price. You can see one purchased a few years back, on the design wall last week. The newest purchase has a total of 12 blocks, all the same pattern. I think a quilt filled of these flowers in different colors (easy to add in some triangles in my own) will go together nicely. Dancing flowers with cute faces in frames or maybe windows of a house. It is something in the way out future, but will work out. All for the low price of $6. Also in the bag coming home is some "quilt hanging hardware". A nice rod and clips will hang just about anything--a bargain for $1. Off to the school for a weekend of basketball. Get to run the concession stand! Yipee! Actually it will be rather fun. The whole family is in on the event. Lola (DD1) is looking forward to seeing her BF (B-Boy) and working the admission table with him. Good clean fun! Just Another quilter in the world. A couple weeks ago I showed the design wall. It was my Leaders & Enders project. This was a great project for middle of the night sewing (sleep doesn't always happen for me). The borders are not attached yet. I think that I will put them on while at retreat in March. OOOH! I am going to retreat!!!! Here is the current middle of the night project. I picked these BOM's up from Joann's back in 2004. I purchased them for no more than $3 a piece. The bird print was the back of my youngest daughter's quilt. The leftovers stayed in the stash for 7-8 years until last week when I gave most of the bird print away. Now, the print looks really well with the blocks. The women has offered to give it back, I offered to let the women come and pull something new. The colors are so old, I am afraid unless I find something else old, the colors it will be hard to match. Can you find the block that was put together wrong in the middle of the night? That is what happens at 3am. I am going to retreat! I don't always get to go, so it is very exciting. What to bring? What to bring? Why of course, everything. The borders for the Leaders & Enders project. 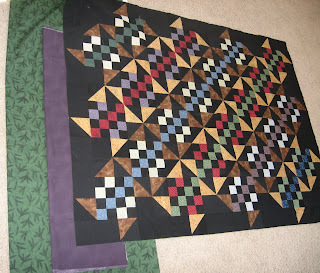 I need to finish the quilting on the "Sister to the Lodge" so the binding can go on. The binding might be attached at retreat. Also, I need to make 3 equilateral triangles in the stitch & flip method. I hate making these blocks. This is for the Dahlia that is forever haunting me. I also need to make the sample for the class I hope to teach. I have a clean house, laundry cooking and food on the table. Time to get back to the stitching now! Have a great weekend. We are off to a small town for a Basketball tourney tomorrow. DD1 is off to Speech Sectionals. She will be back tomorrow for a babysitting job. I might see her on Sunday. She is hoping to spend some time with the boyfriend on Sunday, too. 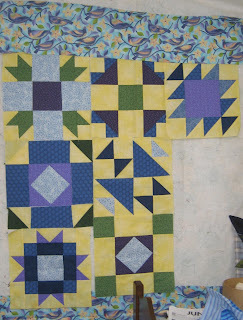 The question has been posed what is your first quilt. My grandmother quilted, but like many families it skipped a generation. My mothersewed and would keep me out of her hair by having me trace around squares made from a cereal box. I cut out the squares and sewed them together. The fabric I used is leftovers from the clothing my mother made me. It is every thing from corduroy, polyester and even some older prints. How this piece didn't end up in the trash or charity box is beyond me. My mom's machine included a "CAM" system. This was how you made the fancy stitches back in the 1970's. These CAM's were used to finish the edge of the piece. The stitching is so nicely done that it overlaps and has 2 rows of stitching for about 6 inches. It is precious and shows my tender age of 10 or under. Rug yarn was used to tie the quilt. This was my first quilt. Many years passed and as adulthood set in I picked up sewing again. Here is a small wall hanging made in the early 1990's. I copied a piece I purchased, made to match the colors that were needed for the room. I had yet to hear of the 1/4" seam. I could not understand why mine looked so different from the purchased one. Where did my points go to? Both of these pieces are in my sew room. The doll quilt hangs on the wall mounted TV stand and the second one is on the wall next to my sewing machine. The Celtic pieces I have been working on and are kept safe by sticking to the small wall hanging. Someday, maybe the family will appreciate these pieces for where one starts when one chooses a new hobby.